When it comes to hookah charcoal, everyone has an opinion on what to use and how to use them. Whether you prefer Ring Coals on a Vortex Bowl or Natural Coconut Cubes on a Phunnel Bowl, the most important thing is to make sure that your coals are properly lit. There are two main categories of hookah coals: quick-lighting hookah charcoal and natural hookah coals. 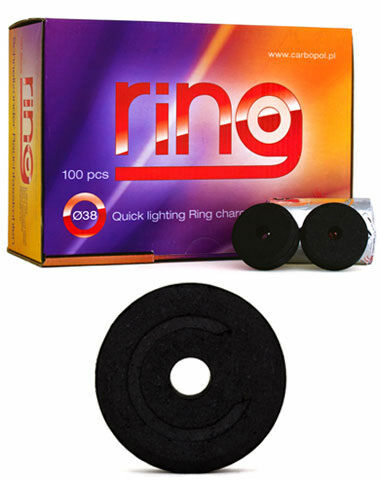 Quick-Light Charcoal is great for travelling, or for use when a stove is not readily available. They are layered with accelerant which allows for this kind of hookah coal to simply be lit with a lighter. You will notice a spark, then in about a minute the whole coal will be cooking. Just because the sparks stop, DOESN'T mean that it is ready. Make sure that the coals have gone completely gray on both sides before you place them on your bowl, this should about 5 minutes. The black parts house the accelerant used to ignite the coal, and if it has not all burned off, then your hookah will taste bad and you will get a headache from inhaling the chemical fumes. Once they're gray, you're good to smoke! The other main type of coal is natural hookah charcoal. These coals are generally made of coconut or bamboo, and have no chemical accelerant on them. Because of the lack of accelerant, they take a little longer to heat, however they leave no aftertaste, and they provide a more consistent heat than quick-lights. The best way to heat these is on a coil stove top. 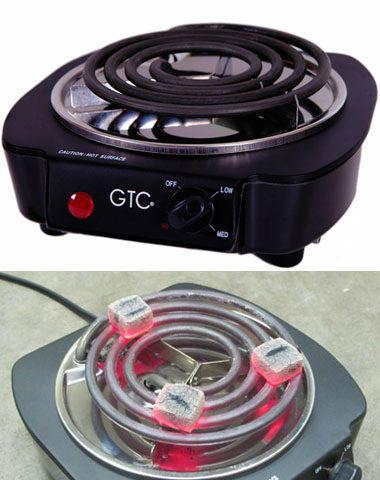 Lay the coals on to the coil heater for 5 minutes on high (or medium-high) heat, then flip them over and give them another 5 minutes. Once they begin to show a white/grey ash coating all around the coal then they're ready to go on your bowl! DO NOT HEAT THESE CHARCOALS ON A GLASS TOP STOVE! Glass stove tops will crack and break under the heat of the coals so if you have this type of stove then we recommend picking up a handy dandy single coil electric charcoal heater. Now, go forth, heat your coals, and smoke away!